These are the bronze issues of Deppert-Lippitz’s Period IV (1984: #538–632), and they feature for the first time a three-quarter facing head of Apollo to left on the obverse, combined with the familiar Milesian lion statant regardant to right on the reverse. These coins have been subject to considerable revision since Deppert-Lippitz first attempted to characterize them. I begin with her account, and then present the more recent interpretations of Kinns (1986) and Ashton and Kinns (2003). Large denomination: 15–18 mm and 3.5–4.0 g (D-L #538–582) featuring the names ΑΛΕΞΑΝΔΡΟΣ, ΑΛΚΩΝ, ΑΝΤΙΠΑΤΡΟΣ, ΑΡΙΣΤΟΚΡΑΤΗΣ, ΑΡΤΕΜΩΝ, ΒΑΣΙΛΕΙΔΗΣ, ΔΑΜΑΣ[ΙΑΣ], ΔΙΟΓΕΝΗΣ, ΔΙΟΝΥΣΙΚΛΗΣ, ΕΥΑΝΔΡΙΔΗΣ, ΘΕΟΔΩΡΟΣ, ΝΙΚΗΡΑΤΟΣ, ΠΡΑΞΙΑΝΑΞ, ΠΡΩΤΑΓΟΡΑΣ, ΣΑΜΙΟΣ, ΦΙΛΙΣΚΟΣ, and […]ΑΓΑΙ[…]. Kinns (1986: 241) adds the names [Α]ΝΤΗΝ[ΩΡ] and ΤΙΜΟΠΟΛΙ, and Ashton and Kinns (2003: 19–20) add the names ΒΑΤΤΟΣ, ΛΙΧΑΣ, and ΠΗΞΙΔΗΜΟΣ. 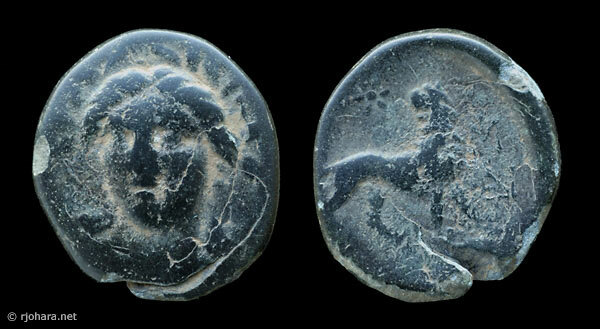 Middle denomination: 13–15 mm and 2.2 g (D-L #583–599) featuring the names ΑΙΣΧΥΛΙΝΟΣ, ΒΑΣΙΛΕΙΔΗΣ, ΖΩΠΥΡΟΣ, and ΣΩΣΤΡΑΤΟΣ. Ashton and Kinns (2003: 12) add the name ΜΕΝΕΣΤΡΑΤΟΣ (noted below). Small denomination: 10 mm and 1.2 g (D-L #600–632) featuring the names ΑΙΣΧΥΛΟΣ, ΑΡΙΣ[…], ΔΑΜΑΣ[ΙΑΣ], ΔΗΜΟΣΘΕΝ[ΗΣ], ΕΠΙΚΡΑΤ[ΗΣ], ΕΡΓΙΝΟΣ (corrected from ΕΡΓΙΓΟΣ; Kinns, 1986: 237), ΕΥΒΑΤΗ[Σ], […]ΛΕΩΝ, ΜΝΗΣΕΑΣ, ΠΡΩΤΑΓΟΡΑΣ (including D-L’s misreading ‘ΗΡΩΤΑΣ’; Kinns, 1986: 241), ΣΑΜΙΟΣ, and ΦΙΛΗΜ[…]. Kinns (1986: 241) adds the names [Ι]ΕΡΟΚΛΗ[Σ] and [Τ]ΗΛΕΦΟΣ(? ), and Ashton and Kinns (2003: 20) add the name ΠΗΞΙΔΗΜΟ[Σ]. 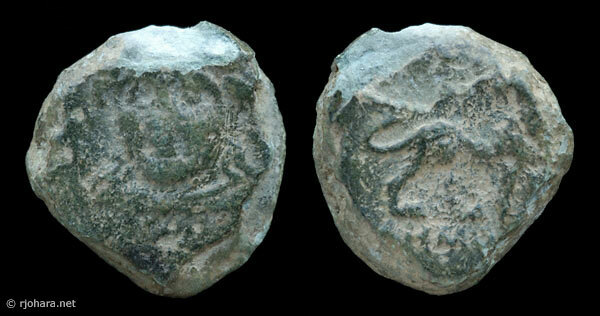 Further supporting the proposed association between the middle-denomination facing-Apollo issues and the first group of statue bronzes, the name ΜΕΝΕΣΤΡΑΤΟΣ, “formerly restricted to the statue type (D-L 979–88), has now also surfaced on the facing head type (Kinns coll. )” (Ashton and Kinns, 2003: 12). Τ-group: ΑΛΕΞΑΝΔΡΟΣ, ΑΛΚΩΝ, ΑΝΤΙΠΑΤΡΟΣ, ΑΡΙΣΤΟΚΡΑΤΗΣ, ΒΑΣΙΛΕΙΔΗΣ, ΒΑΤΤΟΣ, ΔΑΜΑΣ, ΔΙΟΓΕΝΗΣ, ΕΥΑΝΔΡΙΔΗΣ, ΘΕΟΔΩΡΟΣ, ΝΙΚΗΡΑΤΟΣ, ΠΗΞΙΔΗΜΟΣ, ΠΡΑΞΙΑΝΑΞ, ΠΡΩΤΑΓΟΡΑΣ, and ΦΙΛΙΣΚΟΣ. Later group: [Α]ΝΤΗΝ[ΩΡ], ΑΡΤΕΜΩΝ, ΔΙΟΝΥΣΙΚΛΗΣ, ΛΙΧΑΣ, ΣΑΜΙΟΣ, and ΤΙΜΟΠΟΛΙ. “[T]he fully-facing head of the Dionysikles issue and some examples of Artemon, which also have one rather than two stars, should be regarded as indicative of a late date, and these may in fact be the latest in the series” (Ashton and Kinns, 2003: 20). Kinns dates the Τ-group to the vicinity of 260–250 BC, contemporary with the silver Persic-standard drachms and hemidrachms of Miletus (D-L #509–537) with which they share many magistrates and control marks, and he dates the later group to about 250–200 BC, as probably contemporary with the silver Persic-standard Milesian didrachms (D-L #497–508) with which they likewise share magistrates and control marks (Ashton and Kinns, 2003: 8–20). (1a) The rare facing-Apollo silver hemidrachms. There is a small group of Milesian facing-Apollo coins known in silver, two naming ΑΠΟΛΛΟΔΩΡΟΣ (Deppert-Lippitz, 1984: #633–634, 2.66 g and 3.14 g) and one naming ΜΕΝΑΝΔΡΟΣ (Kinns, 1986: 254–255, 2.59 g). Kinns believes these date to about 200 BC and are contemporary with the final group of middle-denomination facing-Apollo bronzes (above) and with the “magistrate” group of Apollo Didymaios bronzes. No examples of this rare type are included in this collection. The headings used below summarize current understanding of the varieties and the chronology of the facing Apollo type as a whole. Large-denomination Τ-group specimens are recorded that name ΑΛΕΞΑΝΔΡΟΣ, ΑΛΚΩΝ, ΑΝΤΙΠΑΤΡΟΣ, ΑΡΙΣΤΟΚΡΑΤΗΣ, ΒΑΣΙΛΕΙΔΗΣ, ΒΑΤΤΟΣ, ΔΑΜΑΣ, ΔΙΟΓΕΝΗΣ, ΕΥΑΝΔΡΙΔΗΣ, ΘΕΟΔΩΡΟΣ, ΝΙΚΗΡΑΤΟΣ, ΠΗΞΙΔΗΜΟΣ, ΠΡΑΞΙΑΝΑΞ, ΠΡΩΤΑΓΟΡΑΣ, and ΦΙΛΙΣΚΟΣ, but no examples are included in this collection. A representative coin from this group is described by Sear (1979: #4517). Small-denomination Τ-group specimens are recorded that name ΑΙΣΧΥΛΟΣ, ΔΑΜΑΣ, ΠΗΞΙΔΗΜΟ[Σ], ΠΡΩΤΑΓΟ[ΡΑΣ], and perhaps other magistrates. A representative coin from this group is also described by Sear (1979: #4518). One possible specimen is included in this collection. RJO 23. Bronze 8 × 9 mm (0.77 g, ↑↑), about 259–246 BC. Obverse: head of Apollo three-quarters left. 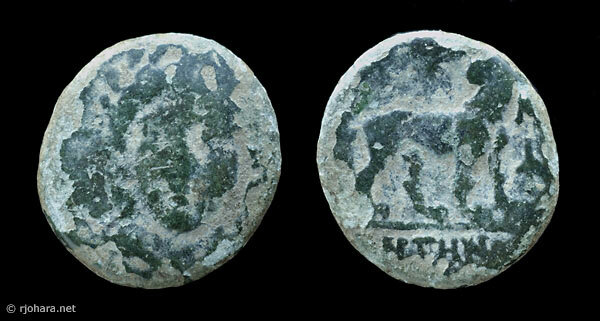 Reverse: lion standing right on exergue line, looking back at sun (off the flan); inscription in exergue [Δ]ΗΜΟ[ΣΘΕΝΗΣ]. Compare Deppert-Lippitz (1984: #606 = BMC #108) who records only one specimen in this denomination with this magistrate. Kinns does not comment on that specimen, and it is not clear whether it belongs to his Τ-group or his later group. RJO 107. Bronze 10 × 9 mm (0.94 g, ↑↑), about 259–246 BC. Obverse: head of Apollo three-quarters left. Reverse: lion standing right on weak exergue line, looking back at eight-pointed sun; inscription in exergue not quite legible, but might be made out with additional comparative material. Large-denomination specimens from Kinns’ later group that name [Α]ΝΤΗΝ[ΩΡ], ΑΡΤΕΜΩΝ, ΔΙΟΝΥΣΙΚΛΗΣ, ΛΙΧΑΣ, ΣΑΜΙΟΣ, and ΤΙΜΟΠΟΛΙ are known. Two examples are included in this collection. RJO 49. Bronze 19 × 16 mm (3.81 g, ↑↑), about 250–200 BC. Obverse: head of Apollo three-quarters left. Reverse: lion standing right (exergue line worn or absent), looking back at six-pointed sun; ΜΙ monogram over illegible monogram to right. The illegible monogram does not appear to be consistent with either the triangular monogram nor the ΝΚ monogram recorded from the known large-denomination later-group specimens (Ashton and Kinns, 2003: 20), and a distinctly six-pointed sun/star is not immediately apparent in any published illustrations. RJO 50. Bronze 17 × 15 mm (3.64 g, ↑↑), about 250–200 BC. Obverse: head of Apollo three-quarters left. Reverse: lion standing right on exergue line, looking back at sun (worn or off the flan); inscription in exergue [Α]ΝΤΗΝ[ΩΡ]; worn monogram to right that is consistent with the triangular monogram illustrated by Kinns (1986: 241) from the single known [Α]ΝΤΗΝ[ΩΡ] specimen; apparent fragment of ΜΙ monogram to right above, a feature not described on the known [Α]ΝΤΗΝ[ΩΡ] specimen. The magistrate [Α]ΝΤΗΝ[ΩΡ] was not recorded by Deppert-Lippitz (1984). Small-denomination later-group specimens “of inferior execution and with fully facing head” are recorded that name ΕΠΙΚΡΑΤ[ΗΣ], ΣΑΜΙΟΣ, and perhaps other magistrates (Ashton and Kinns, 2003: 20). One probable example is included in this collection. RJO 86. Bronze 9 × 10 mm (0.85 g, ↑↗), about 250–200 BC. Obverse: head of Apollo fully facing. 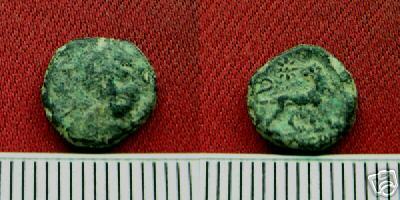 Reverse: lion standing right looking back at six-pointed sun; expected inscription in exergue is off the flan. This is the middle of the three denominations and chronologically the last, being contemporary with the “magistrate” group of Apollo Didymaios bronzes (Kinns, 1986: 253–254; Ashton and Kinns, 2003: 12). Specimens that name ΑΙΣΧΥΛΙΝΟΣ, ΒΑΣΙΛΕΙΔΗΣ, ΖΩΠΥΡΟΣ, ΜΕΝΕΣΤΡΑΤΟΣ, and ΣΩΣΤΡΑΤΟΣ are known, and one example is included in this collection. RJO 106. 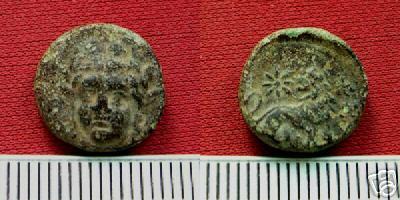 Bronze 13 × 13 mm (2.41 g, ↑↑), about 200 BC. Obverse: head of Apollo three-quarters left. Reverse: lion standing right looking back at eight-pointed sun; ΜΙ monogram over illegible monogram to right; expected inscription in exergue is off the flan.